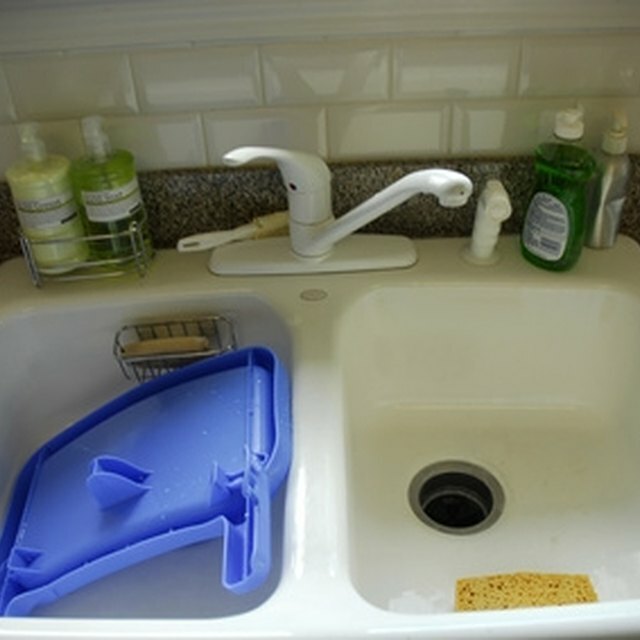 A garbage disposal connects below a kitchen sink to pulverize food particles washed down the drain so they can pass safely through the pipes without clogging your plumbing. Essentially an electric motor attached to a blade mechanism, the garbage disposal is designed to shut down if something jams the blades and the motor is unable to turn. This prevents the motor from burning out. Restarting the disposal is simply a matter of removing the obstacle and resetting the motor. The garbage disposal installs below the kitchen sink. Turn off the disposal by flipping the wall switch for the appliance near the sink to the "Off" position. Insert the metal tongs into the drain and disposal to grab and remove any object lodged in the blades. Use a flashlight to help locate the jam. Wait five minutes for the motor to cool. Open the cabinet doors below the sink to locate the underside of the disposal, which is a cylinder descending below the sink. Push the red reset button on the bottom of the disposal and release. Run cold water into the drain for the disposal and flip the wall switch on to test operation. If the disposal still does not work, check the circuit breaker box and reset the breaker switch, if necessary. Do not place your hands into the disposal.